The only comprehensive survey of Michigan architecture available. Architecture in Michigan, a pictorial survey of Michigan architecture from 1831 to the present, explores the architecture of Detroit and many other cities, towns, and villages. Here is Romantic Michigan, before the Civil War, with dozens of examples of Greek, Gothic, and Italian villas from Grosse lIe to Grass Lake, Tecumseh, and Ypsilanti, as well as Gothic churches. Then there is Glorious Michigan of the exuberant 1870s and 1880s, when architects evoked the Paris of the Second Empire and the doctrine of John Ruskin cast its peculiar spell. And Discreet Michigan, when the wealthy, following the lead of the Vanderbilts in New York, revived the Renaissance as the proper style for Michigan dynasties. And finally Modern Michigan, with Albert Kahn, the greatest factory architect in history, Eliel and Eero Saarinen, the talented Finns, the time when the buildings of modern Michigan began to acquire an international reputation. The expanded text of this unique book dips deep into Michigan history, covering every generation since Michigan entered the Union in 1837. Wayne Andrews, professor of art history at Wayne State University, is a prolific and nationally acclaimed author and photographer. His surveys of the architecture of New York, Chicago, the South, and New England and of American Gothic are well known; his Architecture, Ambition and Americans (1955) and Architecture in America (1960) remain basic works. His most recent book is a study of Voltaire, published in 1981 by New Directions. A pictorial history, richly illustrated with the most important structures in Detroit and many other cities in Michigan . 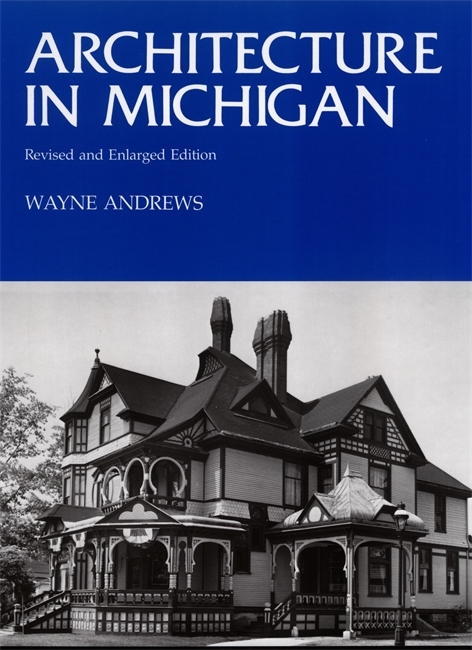 . . Andrews provides a glorious history of architecture in Michigan . . . a noteworthy book. This unique book dips deep into Michigan history, covering every generation since Michigan entered the Union in 1837.